Question: what has three legs, one head, and doesn’t get out much? Answer: that big, heavy tripod that’s too much of a chore to lug around. But it doesn’t have to be that way. Increasingly, manufacturers are coming up with cunning designs that are relatively compact and lightweight, yet extend to lofty operating heights and offer solid support even for heavyweight camera and lens combinations. Better still, the latest tripods are often packed with intriguing features and clever tricks. It’s all good news because, even in broad daylight, a tripod can help you get sharper shots with better, more precise composition. Let’s start at the top and work downwards. Every tripod needs a head, and the smart money is on ball heads. 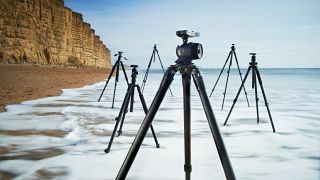 Many tripods are sold as kits, comprising legs and a head, although sometimes you’ll need to buy the legs and heads separately; you don’t have to stick with the same manufacturer for both items, but there are a couple of things to bear in mind if you want to mix and match. The attachment screw on the tripod platform can be 1/4-inch or a larger 3/8-inch in size. You can fit a head with a larger thread to a tripod with a smaller screw, using an adaptor, but you can’t couple a head with a 1/4-inch thread to a tripod with a 3/8-inch screw. It’s also good to check that that the diameter of the ball head’s mounting plate is roughly the same size as the mounting platform on the tripod – diameters tend to range from around 45mm to 60mm. And finally, it makes sense to get legs and a head that have a similar maximum load rating. The main plus point of a ball head, compared with a traditional three-way photographic head, is that they’re much quicker and easier to set up. A single locking screw is all that’s needed to enable a full range of movement, and there are no locking arms sticking out that need to be removed for stowing the tripod away. Drawbacks of conventional ball heads have also been addressed in many of the latest designs. For example, it’s common to find an adjustable friction damper as well as the main locking screw, so that you can tailor operation to suit your camera when fitted with lenses of wide-ranging weights. An additional pan-only release is also often fitted, so you can keep a ball head locked in position but still pan the camera to track action, or to take a sequence of shots for stitching into a panoramic image. The section clamps themselves tend to be either twist-action or locking levers. Some people find twist clamps quicker and easier to operate when the legs are folded down, while others find locking levers more convenient. Locking levers became all the rage a few years ago, but twist-locks have been making a comeback. Another space-saving idea that’s featured in an increasing number of travel-friendly tripods is that the legs swing upwards for stowage, with the head nestling between the feet. Set-up can take a little longer, but it typically knocks about 20cm off the folded height. Down at the bottom, there are two types of feet generally on offer. Rubber pads work best on smooth, hard surfaces, whereas metal spikes are better on carpet and loose ground. Some tripods come with interchangeable feet to suit every occasion, while others might feature rubber pads with retractable spikes. A material consideration is whether to go for aluminum or carbon fiber. Both are capable of providing very sturdy support but carbon fiber tripod kits (with the same heads attached) are typically about 15% lighter in weight than aluminum versions of the same kit. Naturally, the bigger the tripod, the greater the weight-saving, but it generally works out to around 500g. Carbon legs look smart and have more of a feelgood factor, but are more susceptible to shattering if they suffer a sharp knock. And where carbon and aluminum versions of the same legs are available, the carbon edition can sometimes be as much as twice the price.